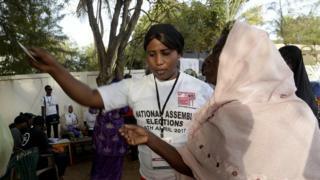 Gambians have voted for members of their one-chamber parliament in the the first polls since Yahya Jammeh left power after more than 22 years. As part of his proposed reform, he is setting up a truth and reconciliation commission to investigate abuses committed under Mr Jammeh's rule. Why is it The Gambia, not Gambia? "Jammeh was a determining factor which encouraged some people to vote and now that he is gone they are not really motivated," Pierre Gomez from Banjul University told the BBC. Mr Jammeh sparked a political and constitutional crisis by refusing to leave office following his defeat in the December 2016 presidential election. He finally headed for exile on 21 January after neighbouring countries threatened to remove him by force. What happened in the last parliamentary elections? Mr Jammeh's then-ruling Alliance for Patriotic Reorientation and Construction (APRC) won 43 out of 53 seats in 2012. The opposition largely boycotted the polls and one opposition member was elected. Four independent candidates also won seats. The president had the power to select a further five members, which he did. A coalition of seven parties that supported President Barrow during the presidential election has collapsed. And the list of parliamentary candidates shows parties formerly in the coalition vying against each other in various constituencies. President Barrow used to be a member of the United Democratic Party (UDP), but quit after being chosen as the opposition coalition's presidential candidate so as not to be seen as favouring one party within the grouping. Mr Jammeh's APRC remains intact, and is taking part in the election as an opposition party for the first time since he seized power in a 1994 coup. What is the electoral process? The National Assembly is made up of 53 MPs who serve for a five-year term. In the past, 48 were elected by voters while five were appointed by the president. This time, the Independent Electoral Commission (IEC) has declared that all 53 constituencies will be contested and it has published a list of the 239 candidates contesting seats. To qualify a candidate must be at least 21 years old but a law requiring candidates to pay $10,000 (£8,000) has recently been repealed. How is voting carried out? Any citizen aged 18 years or older and of sound mind has the right to vote. The IEC rules say voters must be on the electoral register and have a polling card. Also, they must attend the right polling station and avoid turning up drunk. There are 886,578 registered voters, who will make their choice of candidate by dropping marbles into drums - the method The Gambia has long used in elections. This is said to prevent possible multiple voting and presiding officers "listen to the sound of the marble/token hitting the drum". Who are the electoral observers? The European Union has deployed an observation mission, with 20 people who will monitor the ballot across the country. The authorities banned the EU from monitoring the last presidential elections. However, African Union officials were allowed. What is the likely outcome of the poll? Local media have said that the vote will be one of the closest since the country's independence in 1965. President Barrow needs a majority in the National Assembly if he is to successfully push through his political reforms. But with the break-up of the coalition that sponsored him at the last election, there are doubts whether now independent parties will continue to back him. Mr Barrow has campaigned for pro-government candidates, but it is unclear whether the poll winners will continue to support him. And the opposition APRC may take advantage of the situation to win seats. If it succeeds, it is likely to frustrate the government's agenda.